The TDA4687 is a monolithic integrated circuit with a luminance and a colour difference Interface for Video processing in TV receivers. Its primary function is to process the luminance and colour difference signals from a colour decoder which is equipped e.g. with the multistandard decoder TDA4655 or TDA9160 plus Delay Line TDA4661 and the Picture Signal Improvement (PSI) IC, TDA467X, or from a feature module. The required input signals are:Luminance and negative colour difference signals2 or 3-level sandcastle pulse for internal Timing pulse generationI2C-bus data and Clock signals for Microcontroller control.Two sets of Analog RGB colour signals CAN also be inserted, e.g. one from a peritelevision connector and the other from an on-screen Display generator. The TDA4687 includes full I2C-bus control of all parameters and functions with Automatic cut-off control of the picture tube cathode currents. It provides RGB output signals for the Video output stages.The TDA4687 is a simplified, pin compatible (except for pin 18) version of the TDA4680. The module address via I2C-bus CAN be used for both ICs; where a function is not included in the TDA4687 the I2C-bus command is not executed. The differences with the TDA4680 are:No Automatic white level control; the white levels are determined directly by the I2C-bus dataRGB reference levels for Automatic cut-off control are not adjustable via I2C-busClamping delay is fixedOnly contrast and brightness adjust for the RGB input signalsThe measurement lines are triggered either by the trailing edge of the vertical component of the sandcastle pulse or by the trailing edge of an optional external vertical flyback pulse (on pin 18), according to which occurs first. The TDA4686 is like TDA4687 but intended for double line frequency application. 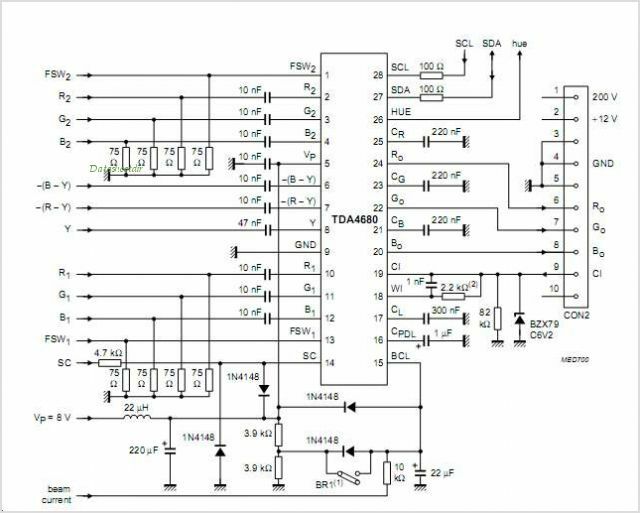 This is one package pinout of TDA4687,If you need more pinouts please download TDA4687's pdf datasheet. TDA4687 circuits will be updated soon..., now you can download the pdf datasheet to check the circuits!